Pope Francis is a pope of the people, and his teachings have been praised and shared by the faithful and nonreligious alike. 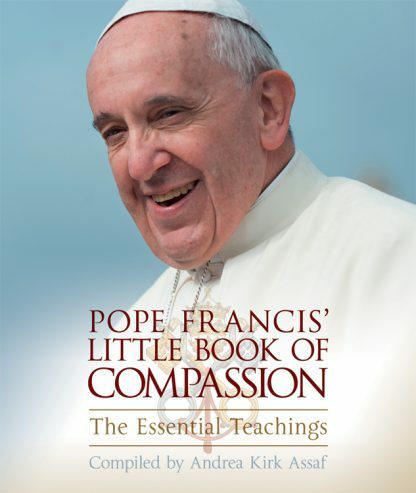 Exploring themes universal to all people, Pope Francis� Little Book of Compassion offers inspiration and hope from one of the world�s great spiritual leaders. In it, the Holy Father explores how living a life of compassion can be practiced in five areas of life: prayer, mercy, forgiveness, solidarity, and charity. Pope Francis appears to be changing the face of Roman Catholicism. He has infused the fusty institution with openness and optimism, faced off against established power interests within the Vatican, reformed the Church�s finances, and, most importantly, asked that Catholics approach one another and non-Catholics with candor, humility, and love. He has made the papacy and the Church relevant once again. �There is so much indifference in the face of suffering. May we overcome indifference with concrete acts of charity."